The county of Nairnshire is also known as Nairn and serves as a historical and registration county in Scotland. The county is also a lieutenancy area of Scotland. Set on the Moray Firth, the county lies east of Inverness, and the historic county town is Nairn. Part of the county’s consists of moorland while the other condensed on the coast. Head further inland for views of highland plateaus where summits rise to over 2,000 feet, making way for the River Findhorn. The Pictish people initially inhabited the region before forming part of the ancient province of Moray, Scotland. The town of Nairn is the only large town in the region and serves as a top-rated seaside resort, boasting of the longest sand beach in Europe. The Links in Nairn is one of the most beautiful golf courses on in Scotland. Highlights include the Culbin Sands reserve which serves as a unique reserve and offers excellent opportunity to observe oystercatchers, godwits, knots, and more. Take a walk through Cawdor Castle and Gardens which was built around the 15th century and serves as a literary connection to Thane of Cawdor" in the tragedy Macbeth penned by William Shakespeare. You shouldn't miss the 4000-year-old Clava Cairns stone circles above the River Nairn either! 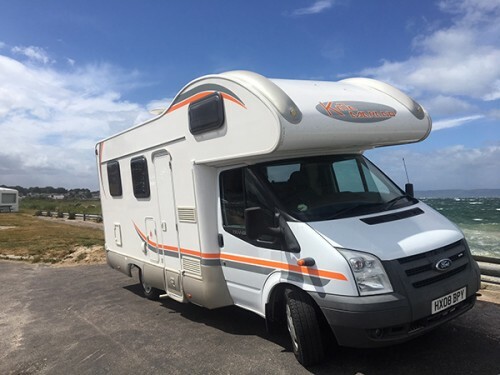 Savour the beauty of the charming county of Nairnshire with Camperbug’s motorhome hire options! I am FordKatamarano, hire me today! The origins of the motorhome date back to 1910 when the Pierce-Arrow motor company introduced the Touring Landau model at the Madison Square Garden auto show. The Pierce-Arrow?s entry was specialized with camping enthusiasts in mind by providing cargo compartments for camping equipment and even an on-board toilet.